Written in plain-English for business people without any legal training, Law For Small Business For Dummies covers everything you need to be aware of regarding the law when you're starting and running your own business. Cutting through the jargon that can make even the pros scratch their heads, this book quickly gets you up-to-speed on the key areas of business law, including contracts, websites, intellectual property, data protection and partnership agreements. Plus, you'll find out how small business law applies to advertising and marketing, confidentiality agreements, the sale and supply of goods (including e-commerce), negligence and product liability. There were 526,000 new businesses registered in the UK in 2013—and, at some point, all of them will be faced with legal risks that could make the difference between success and failure. One claim could wipe out a fledgling business' profits, and hit even big businesses harder than they could ever imagine. If you're the owner of a new business and need to get a handle on the ins and outs of small business law—and don't have the budget to employ an in-house legal advisor—this trusted, approachable guide is your answer. 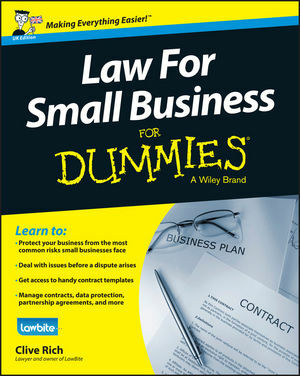 If you're an existing business owner or an aspiring entrepreneur thinking about starting your own business, Law For Small Business For Dummies gives you answers to questions you didn't even know to ask! Clive Rich is a lawyer, mediator, arbitrator and negotiator. He is Chairman of LawBite, an online legal service providing 'Simple Law for Small Companies' (www.lawbite.co.uk).